Matrigel invasion assay of H1299 cells treated with SDF-1α or SDF-1α plus Epothilone B prior to 0 or 2 Gy irradiation. After the treatment for 12 h, the H1299 cells that migrated to the bottom surface of the membrane were stained with Giemsa, and the number of migrated cells was calculated manually. ABT-751 (E7010) binds to the colchicine site on β-tubulin and inhibits polymerization of microtubules, not a substrate for the MDR transporter and is active against cell lines resistant to vincristine, doxorubicin, and cisplatin. Phase 1/2. Cell viability in H292 monolayer cells after 3-day treatment and spheroid volume in H292 3D culture after 7-day treatment with ABT751. Data points are means ?SD for three individual experiments. IC50 values were calculated to emphasize the differences in drug potency in 2D verses 3D cultures. ABT751, IC50 of 177.2 ?17.3 nM for 2D and 670.2 ?257.6 nM for 3D. KHS101 is a small-molecule inhibitor of TACC3, which is a key component of centrosome-microtubule dynamic networks. SSE15206 is a tubulin polymerization inhibitor that has potent antiproliferative activities in cancer cell lines of different origins and overcomes resistance to microtubule-targeting agents. Vindoline is a chemical precursor to vinblastine and exhibits antimitotic activity by inhibiting microtubule assembly. Lexibulin (CYT997) is a potent microtubule polymerization inhibitor with IC50 of 10-100 nM in cancer cell lines. Phase 2. CYT997 inhibits cellular proliferation in acute myeloid leukemia (AML) cell lines. Cell viability was measured by a 3-(4,5-dimethylthiazol-2-yl)-2,5-diphenyltetrazolium bromide (MTT) assay in 96-well plates in the presence of increasing concentrations of CYT997 for 24 h.The results represent the mean ?SD of four replicates. Epothilone A is a paclitaxel-like microtubule-stabilizing agent with EC0.01 of 2 μM. Dose-dependent disruption in the distribution of α-tubulin following exposure to albendazole. Experimental treatments included vehicle (DMSO), 0.1 μM, 0.5 μM and 1 μM albendazole for 24 hours. α-tubulin was visualized using immunofluorescence (green) and nuclei were stained with DAPI (blue). 40x fluorescence microscopy was used to assess changes in cellular morphology and tubulin distribution. CW069 is an allosteric, and selective inhibitor of microtubule motor protein HSET with IC50 of 75 μM, significant selectivity over KSP. Spindle morphology before and after addition of the HSET inhibitor (CW069, 200 μM). MTs were visualized by SiR-tubulin staining. Arrowheads indicate split poles. Images were acquired with 5 z-sections (separated by 3 μm) and displayed after maxium projection. Two independent KO lines were analysed (clones #4 and #23). Bar, 5 μm. Monomethyl auristatin E (MMAE) is a synthetic antineoplastic agent, which is linked to a monoclonal antibody (MAB). It is also a microtubule-disrupting agent . Triclabendazole is a benzimidazole, it binds to tubulin impairing intracellular transport mechanisms and interferes with protein synthesis. Immunohistochemistry and quantification of cleaved caspase 3 expression in DU145-DR tumor xenografts. Scale bar, 100 μm. Data represent the mean ± SD. *p < 0.05. 4'-Demethylepipodophyllotoxin is an antimitotic agent which binds to monomeric tubulin, preventing micro-tubule polymerization. It is a potent inhibitor of microtubule assembly. Colchicine is a microtubule polymerization inhibitor with an IC50 of 3 nM. Griseofulvin, a production from some strains of the mold Penicillium griseofulvumam, is able to inhibit cell mitosis by interfering with microtubule function. TRx 0237 (LMTX™) mesylate is a second-generation tau protein aggregation inhibitor for the treatment of Alzheimer's disease (AD) and frontotemporal dementia. CK-636 is an Arp2/3 complex inhibitor with IC50 of 4 μM, 24 μM and 32 μM for inhibition of actin polymerization induced by human, fission yeast and bovine Arp2/3 complex, respectively. 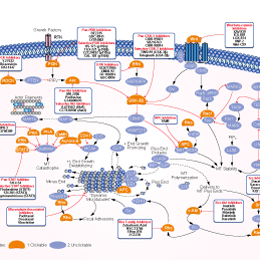 ELR-510444 is a novel microtubule disruptor with potential antivascular effects and in vivo antitumor efficacy, causing a loss of cellular microtubules and the formation of aberrant mitotic spindles and leading to mitotic arrest and apoptosis of cancer cells. JQ1 and chemotherapeutics (vinorelbine, docetaxel, cisplatin and carboplatin) cooperate to induce apoptosis. MDA-MB-231 and HS578T were exposed to drugs alone and in combination with JQ1, at the indicated doses. Apoptosis was examined after 72 hours of treatment by flow cytometry using Annexin V/ PI staining as previously described. Ixabepilone is an orally bioavailable microtubule inhibitor. It binds to tubulin and promotes tubulin polymerization and microtubule stabilization, thereby arresting cells in the G2-M phase of the cell cycle and inducing tumor cell apoptosis.